Opened in the summer of 2010 by an experienced traveller who knows exactly what backpackers want and expect! Sited in a beautifully converted 19th century building, we have added all the modern amenities expected without taking away from the original charm and character of the building! At Global Village we embrace our rich and colourful culture and history. From our shipbuilding roots (The Titanic), to traditional Irish sessions and poets to modern day culture like urban street art done by local Belfast talent! Located in the bustling Queens Quarter we are about a minutes walk from major tourist attractions like The Botanical Gardens, Ulster Museum and the magnificent Queens University. We are even less than a minute from Botanic Avenue which is always buzzing due to the many shops/cafes/restaurants/bars and nightclubs so there really is something for everyone! Our staff are young, energetic, helpful and always up for a good laugh. They aim to ensure you have the best possible experience and fun while in Belfast. All our staff at Global Village have personally been on all the tours so that we can give informed advice on which tour suits your needs - all tours can be booked in the hostel by reception. There is always a friendly environment to meet other travellers and have a few beers in the beer garden/BBQ area. At Global Village we do not operate a curfew, allowing you to make the most of your time here. Our aim is to ensure we remain the cleanest hostel in Belfast. We are committed to keeping the hostel as clean today as the day we opened. 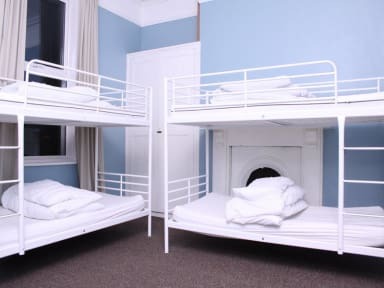 The entire hostel is cleaned twice daily and all beds are made with fresh linen. The area and hostel is very secure with only guests being able to access through double doors. Each room has individual locks and there is a secure left luggage facility available at no charge. We aim to make your stay as pleasant as possible and have created a real homely feel which is great when you have been traveling for long! We have a fully equipped kitchen with all new facilities for guests to cook up a storm. The kitchen/games room is the perfect place to relax, meet and have fun with other guests. The hostel is centrally heated and has hot water 24hrs a day. There are laundry facilities which guests can use at a small fee. Our dorms are all clean and spacious with very comfy mattresses. A basic breakfast is provided for free each morning, with tea and coffee available all day. So whether your an early bird or more a creature of the night this is the perfect location to explore what Belfast has to offer! Our aim is to provide an excellent standard of budget accommodation; where our guests can relax and meet new like minded people in a clean, comfortable and relaxed environment! 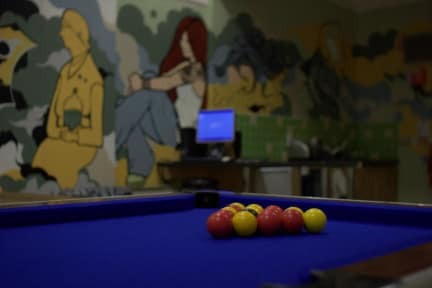 Best hostel ever, the guys were supernice and help me out with everything, the rooms are big and beds superconfy, the staff took us out everynight to the best pubs in Belfast, they were super fun and kind. Special shout-out to OB, Ferran and Aurelien, who were amazing staff members and made me feel like home!! I will definitely come back!! Merci à cette équipe pour ce super accueil vous êtes géniaux ! Personnel professionnel, auberge propre et ambiance très sympathique ! Trés bonne ambiance, membre du staff trés cool et present avec les guests !